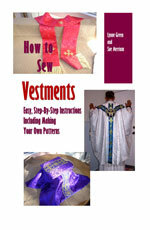 I plan to weave the fabric for a deacon's stole in silk. I need to know how wide and how long I should make the material. Is there anything else that I need to know. You probably need to make your fabric about 32 inches square. That should be sufficient to make a stole.